Today’s data-driven customer is redefining the way transaction and fee data is consumed, analyzed and integrated into their daily and strategic processes. They are expecting you, their banking partner, to better align your information reporting to their new normal. 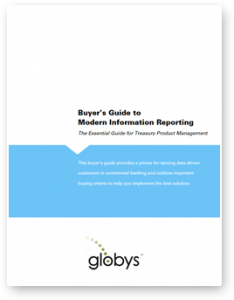 As an additional reference, the guide also includes a vendor comparison matrix which outlines frequent requirements used by commercial banks for selecting a modern information reporting solution.